Do you eat organic? You won’t like this! CBC News reports, “Nearly half the organic fresh fruits and vegetables tested across Canada in the past two years contained pesticide residue, according to a CBC News analysis of data supplied by the Canadian Food Inspection Agency (CFIA). Of the 45.8 per cent of samples that tested positive for some trace of pesticide, a smaller amount — 1.8 per cent — violated Canada’s maximum allowable limits for the presence of pesticides, the data shows. 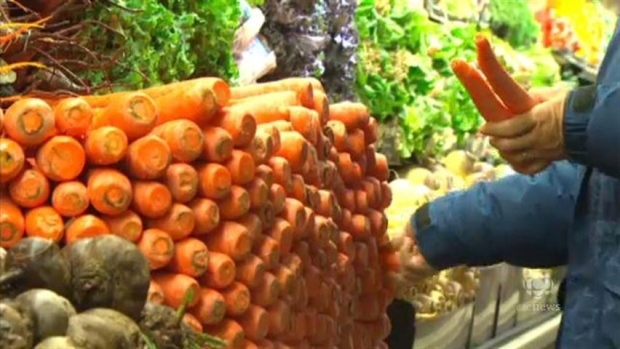 The data released to CBC News under the federal Access to Information Act includes testing of organic fruits and vegetables sampled between September 2011 and September 2013. The results were not what Winnipeg organic consumer Mathieu Rey was expecting. “I would hope that the products are without pesticides. That is what I would be looking for,” Rey said in an interview. “I’m trusting the companies to provide a non-pesticide or pesticide-free product.” As widespread as the pesticide residues were, they were still considerably less than the 78.4 per cent of non-organic samples the inspection agency found containing pesticide residues, violating the allowable limits 4.7 per cent of the time. The CFIA told CBC News that none of the test results posed a health risk. The agency did not prevent any of the food from being sold as organic. Most of the fresh produce sampled was imported, with only one-fifth of it grown in Canada. Of the domestically grown samples, about 43 per cent tested positive for at least one pesticide — slightly lower than the 46 per cent of imported samples. Matthew Holmes, executive director of the Ottawa-based Canada Organic Trade Association, called the findings concerning. “We see pesticide residues throughout our environment. It’s in our soil, they’re in our water, drinking water now, and there’s new reports coming out showing there’s pesticides in fetal cord blood. So unfortunately, it’s really hard to have a zero pesticide residue any longer,” he said. Pesticides were measured in amounts as little as 0.0001 parts per million (ppm) to greater than three ppm. “These are very low amounts,” Holmes said. Rick Holley, an expert in food safety at the University of Manitoba, agreed the residue measurements are small. But Holley added that the data indicate that consumers who often pay extra to buy organic food might not always be getting their money’s worth. “If the money is being spent to avoid pesticide residues and have access to food which is healthy, then I think the money is not well-spent,” he said. “[Pesticides] will not be absent.” Holley said that’s partly because the analytical methodologies are capable of detecting residues in parts per billion or parts per trillion, well below the allowable limits. How could pesticides get on produce? He explained that pesticides can get onto organic produce through contamination of water or soil through pesticide spray drift from neighbouring farms, and through contact with non-organic produce after harvest. But Holley said some of the larger residue measurements suggest an organic producer deliberately used a pesticide that is not allowed. “Where pesticide residue levels are at or above the maximum residue levels prescribed, then I think that there’s probably reasonable evidence that that has been the situation,” he said. Take, for example, an organic tomato imported from Mexico, sampled in the Manitoba-Saskatchewan region. It was tested for four different pesticides and contained residues of two of them — both in amounts that exceeded the allowable limits for those pesticides. In contrast, some of the samples tested positive for numerous pesticides but at lower levels. An organic pepper imported from Mexico and sampled in Quebec was analyzed for 13 different pesticides and was found to contain minute amounts of 10 of them. None of the amounts measured on that pepper violated the maximum allowable residue limits for the pesticides in question. Holmes said past studies have shown the quantity and incidence of pesticide residues in organic produce are consistently lower than those in non-organic. Analysis of the fungicide thiabendazole in the CFIA’s latest data suggests the amount of pesticide present in the organic produce is lower than on regular produce. The average quantity of thiabendazole measured on organic apples was 0.02 ppm whereas the average amount measured on non-organic was 0.3 ppm — about 15 times higher. “I think consumers are looking for not necessarily a zero level, but they’re looking to not contribute to the pesticide residues that are out there and they’re looking to reduce their exposure as much as possible. And I still think we’re seeing in this data that organic offers that,” Holmes said. He acknowledged there is room for improvement on the part of organic producers, and said he would like to see the amount of pesticide as low as possible. “The organic sector absolutely believes in continuous improvement, and I would love to see that level go down for all products, not just organic,” said Holmes. Synthetic pesticides are not allowed under certified organic production regulations, but some other types of pesticides are permitted. The CFIA did not analyze the data to determine what proportion of the positive tests are for pesticides permitted in organic production.